The week after Christmas I was busy enough to not really miss football. The week after the New Year, I had a little time, and it would have been nice to have a little bit of Bundesliga or something to take the edge off a bit, you know? By the time the Bundesliga returned to action three weeks ago, Bundesliga was never going to be enough. I needed an Effzeh match, badly. I was happy, by Friday, to know the weekend would not pass without some 1. FC Köln football. I patiently kept my #Effzeh jersey on the hanger, rather than sport it on Friday to indicated to all of Seattle I encountered on the last day of the work week (approximately none of whom would have noticed), that the 2. Bundesliga was back, meaning so too was my club. And Friday and Saturday were full of Fußball. It was grand, but when I awoke Sunday knowing that even my early morning (Pacific Standard Time) was still late enough in Germany for the match to be posted on FC-TV, I was only too happy to pull the jersey over my head (it it a wee bit tight in the shoulders, but try to stop me from representing) before I went to brew coffee to go in my FC-Schaal coffee mug, which I purposely did not use Saturday. Now, life with two young boys does not allow for the simple process of “wake up; watch football” that would make the next step obvious, even in the most-routine of weekend mornings. This Sunday, however, our entire city was blanketed in snow. Not a sentence you want to hear when you’re itching to get to a football match, much less at 9 in the morning, but also not a sentence you can deny when it comes from a four-year-old you adore more than anything in the world. Plus, I’m a Michigan native. Knowing our sidewalks were unshoveled was already gnawing at me. Owen played in the snow. I cleared the sidewalks. Henry removed his boots and stood in the wet in soaked socks. Now, if’n we were living near or in Köln, I’m sure the day would have started differently, but the fact is weekend match days for me usually start with the 100-percent avoidance of social media and the internet in order to avoid learning the result of the match until I get the chance to sit and actually watch the match. Hence, it’s a bit like I had two completely separate Sundays. I had the one that began with snow activity and ended with cleaning up behind my making a giant pot of borscht, and there’s the other one in which I shift time and space for not-quite two hours to take party in Spilldaach! in whatever way I’m able. I already bored you with the highlights of the former. Now I drag you through an even-lengthier trip to the latter. Paddy Helmes trying on the role of “vocal on-pitch leader”? Sure. Why not? I don’t notice such things until I do, but is Patrick Helmes asserting himself as a leader of this team now that he’s been around a while, or has he always done this and I simply never noticed? Whatever leadership Brecko provides his teammates is not as demonstrative as this. I’m not even certain it’s needed, but I simply just like seeing this sort of thing. Not sure I’d have thought of Helmes as the guy to deliver it, but he definitely has the bona fides and has done very well since arriving. 1: One of my favorite things about watching Effzeh home matches is hearing the FC-Hymne continue after the sound system stops playing it and the whistle to start play has blown. The commentator notes coach Peter Stöger went with the same starting eleven as he did in the Derby in Düsseldorft before Christmas, which sparks great memories to pair with the glow of the Hymne. 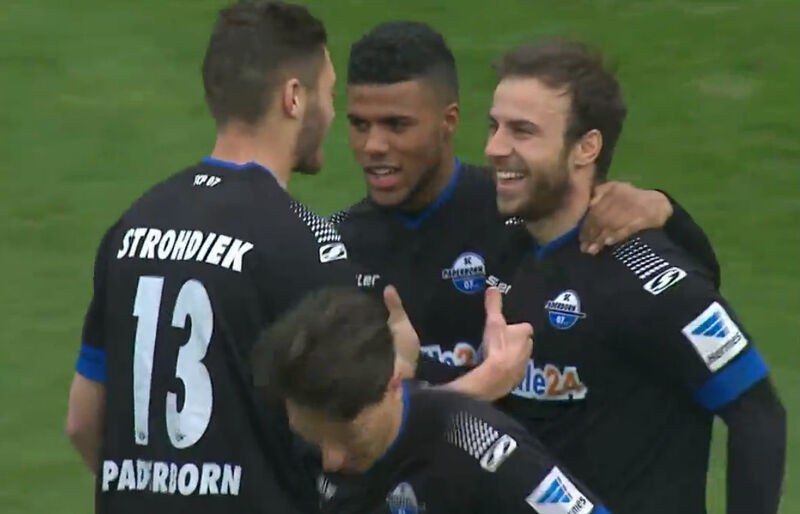 As for Paderborn, it’s a 4-1-4-1 of a bunch of dudes whose names I wasn’t trying to write down. Go see Transfermarkt if you must know. 5: Here’s a spot where my American shines though. Anthony Ujah tries to shield the ball with his body from defender Christian Strohdiek while Strohdiek throws himself at Ujah and then to the ground, clutching his face like a giant sissy. The faking injury and diving to draw calls is EASILY my least-favorite part of the sport. I’ve said before and I stand by it, don’t ever let me be in charge, because I’ll have an office reviewing every instance of dudes falling down and levying suspensions on anyone deemed to be faking. That said, as I watch the play a few times, I think maybe Ujah did see where Strohdiek was and maybe throw the elbow a bit in his path. 8: Yannick Gerhardt sees Marcel Risse and sends a long pass across the pitch to him. Risse has a one-on-one opportunity, but ultimately dribbles directly into Florian Hatherz’s feet to end any threat. Not the most-creative effort you’ll see from Risse, but great look from Gerhardt. 11: Daniel Halfar manages to get slightly behind his mark on the right side, at least enough to attempt a cross, but his ball ends up striking the side of the goal rather than finding action in front of it. I seem to remember Lukas Kruse doing a lot of sweeper-keeper in the Hinspiel in Paderborn. I wonder how much this is impacting the Köln approach, which has been dull. I know I said I’d been aching for football and, in particular, Effzeh football, but this isn’t quite what I’d imagined. 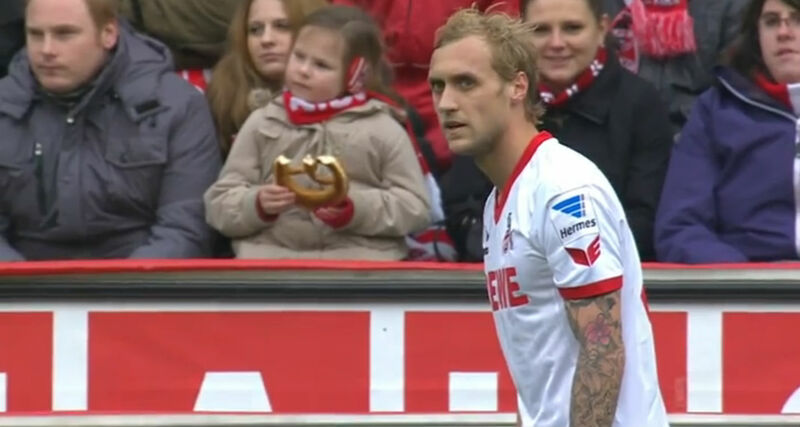 Come on, Effzeh! 16: At the risk of sounding like a complete crank . . . what are the odds the 1. FC Köln can be the first German club to break themselves of the habit of singing the “Schiess ein Tor” song? I mean, come on. The primary objective is to “score a goal.” It’s therefore a bit obvious for a cheer, isn’t it? Besides, the damned thing is heard in every stadium, which means loser points for a lack of creativity. I shan’t be moved on this one. It’s an awful chant. 18: Mario Vrancic, under the guise of trying to get to a ball in the air, throws his body into the abdomen of Timo Horn who was never not going to get to the ball, what with the ability to use his hands and all that. For my money, it’s a bit of a dirty play. It looked like Dominic Maroh gave Vrancic a slight shove on his way toward Horn, but I don’t think that stole Vrancic’s ability to control himself. He appeared, to me, to take the shot because he could take the shot. You’ll never convince me Vrancic ever believed he had a shot at the ball here. If this were a hockey game, I’d say Vrancic would need to keep his head up, especially when the fourth line takes the ice, because he’s got a bit of a gooning coming to him. 28: This is some boring football, and I say this having watch Hamburger SV match from last weekend a few days ago. 37: Elias Kachunga gets free along the left side when a sliding clearance attempt by Matthias Lehmann fails to send the ball into touch. Gerhardt has to close from behind, as Kachunga reaches the area. Gerhardt shoves Kachunga enough to make Kachunga think he has a better chance falling on his face than he does trying to get around the young midfielder. The referee isn’t buying it, fortunately. But WHAT a crap bit of play from Kachunga. Again, I get that it’s part of the football culture and somehow widely accepted, but I’m not going along with it. I think it is a wart on an otherwise gorgeous face. 38: Jonas Hector passes to Risse deep on the left side and then heads for the penalty area. Risse tries to pass through two defenders to hit Hector on the rush. Risse has been one of my favorite players this season, so it pains me to say that he has been awful in this match. Uninspired attack in one-on-one situations and uninspired pass attempts. Very disappointing to watch. 40: Vrancic gets the yellow he might should have gotten earlier for his attack on Horn. After shoving Gerhardt to the ground, Vrancic attempts a slide tackle on Patrick Helmes near mid-field. There was some contact, but Helmes embellishes, looking like someone whacked him in the shins with a baseball bat. Shameful, even when it helps my side. 43: I have no idea what’s happening. Alban Meha drills a free kick into the face of one of his teammates, who goes down in a heap (at least he’s not faking? ), while the ball rolls out to the right side of the pitch. Vrancic collects the ball and brings it back toward the middle. Risse fouls Vrancic, but then, as Vrancic is on the ground, Ujah vehemently sends the ball into the stands and immediately starts barking angrily at Vrancic, which brings players from both sides to the area to have their say. This has the word “Rüdelbildung” stuck in my head. Why you mad, Tönn?! It appeared, when the ball first deflected out toward the touch line, that Ujah raised his arm, as if to alert someone to the man injured and expected the ball to be played into touch. That’s the closest thing I have to an explanation of what became a very heated moment. Maybe I’ll ask Tony on Twitter, eh? 45: Wait . . . did we just get a shot on goal? Miso Brecko put a long cross into the area, somehow finding the head of Helmes, who shot the ball over goal. Still, that’s the closest we’ve seen from the Billy Goats all day. Maybe it will spark something after halftime. Halftime: Slawomir Peszko is entering the match for the second half, which isn’t a shock. His style definitely tends to bring some excitement to the offensive attack, which is grossly needed here. But Bård Finne is also coming on for his debut? I admit, I’m curious about Finne, but didn’t expect to see the 18-year-old Norwegian striker for quite a while yet. Can’t tell who got benched, but the timing would seem to indicate Stöger might be sending a message. 46: Barely back to action and Brecko has a yellow card, and Paderborn is getting a free kick from the outer edge of the area to Horn’s right. I’m not certain there was enough contact for a foul, much less a card. Meha went down as if there were, but the contact was light, if there at all. Meha, suddenly returned to health from the violent, if invisible, collision with Brecko, gets a slight deflection off the head of Halfar to help the ball elude Horn and give the visitors the lead. 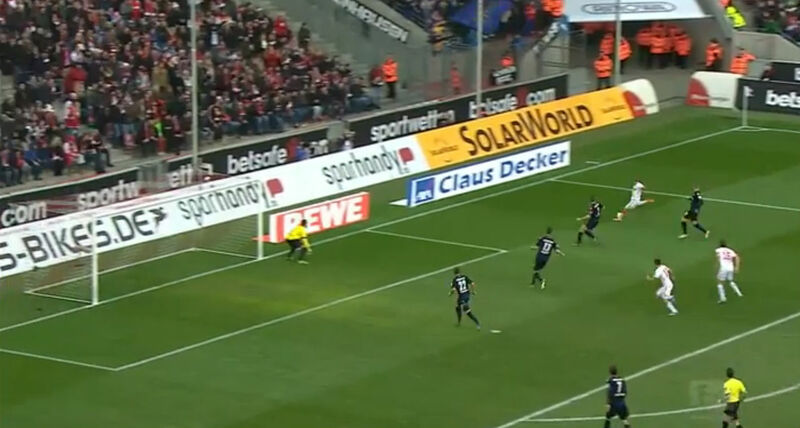 Halfar’s leaping attempt to block ends up diving Paderborn the game-winner. Not bad for a guy who, moments ago, looked like he was hobbled from injuries to either leg, as well as potentially having been concussed the way he grabbed his head. Dirty cheating rotten sonofa. . .
That’s right. They go have a laugh with the rest of your dirty, rotten, cheating, diving teammates about how you finally pulled one over on the referee. How do you live with yourself?! 49: The commentator says 1. FC Köln is the second-youngest team in the 2. Bundesliga. That’s pretty cool, or it would be if I weren’t still pretty angry about falling behind and how it all transpired. And now Meha is apparently just going to fall over any time anyone touches him. Grand. 51: Kachunga, not wishing to be outdone by Meha, also wants to remind everyone how easily he, too, can be toppled. 52: Thank you Risse for putting a shoulder into Meha. If he’s going to fall down continually, may as well legitimately help him at least once. The young debutante is the recipient of a great through ball from Risse. He gets too deep to have much of a shot on goal, but that doesn’t stop him from trying it anyhow, rather than passing back to the two teammates trailing the play with MUCH better angles for a goal attempt. If I were 18 and in his position, I’d have launched that into the upper deck of a neighboring stadium. Still, it was a moment of excitement in a game desperately lacking them. How is this match not level? Peszko managed to get clear at the edge of the area for a clear shot on goal, which was saved by Kruse. 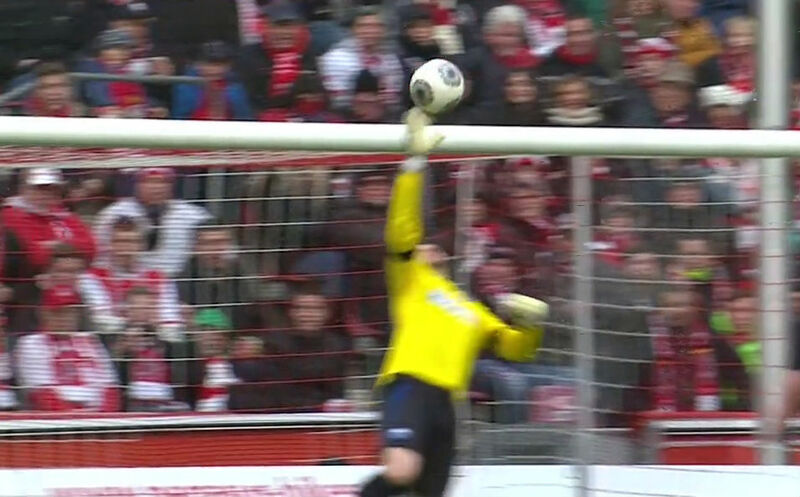 The Paderborn keeper could not, however, hold the ball, which fell directly to Finne. Finne, however, put his shot right into the feet of the sliding Kruse. What an opportunity! I honestly can’t quite grasp how this did not result in a goal. Rough stretch for Finne. It get’s better! At least the home side is cranking the heat upwards. This is already infinitely more interesting than the first half was. Even so, is it too much to ask of an 18-year-old to finish those chances? My goodness, Bård! Finne feeling frustration. Seriously, it’ll get better. Relax, bro! 62: Luckily, Kachunga is no sharper than Finne is, or it would be 0:2, but the two-on-one break ends with Kachunga curling the ball nicely over the cross bar. Cheers, mate! 65: That’s a pretty nice-looking pretzel you have there, young lady. Marcel, you know you want that pretzel. Don’t even pretend like you’re not thinking of that pretzel. 68: Now Kazuki Nagasawa is coming on for Brecko. Nagasawa, like Finne, I just assumed was for the developmental squad and depth. Never expected to see him this early in the season. A great strike by Halfar is barely deflected by Kruse’s fingertips onto the crossbar.Was a gorgeous shot, but turns out for nothing. Might simply not be our day, folks. 73: Pretty sure the commentator said the guy who entered the match for Kachunga just now spent some time in prison. So . . . that’s pretty cool? 85: I’m calling it now, folks. We are not getting a point today. Risse sprints with the ball from the defensive half of the pitch well into the offensive area. His pass to Nagasawa is deflected, but not enough to keep the young newcomer from spinning away from the defender and recovering the ball, which he quickly played forward to Finne. But you know how Finne’s day is going, so . . .
90+: Just for one last tease, Nagasawa manages a look from the right side of the area, but his shot bounds harmlessly to Kruse. The second-half opportunities have been bountiful, but the final touch was never quite good enough. I don’t know exactly who these dudes are, but I want to party with all of them. And that’s not the right stuff when local royalty is paying a visit. Better stuff next week, boys. Nothing earned yet! 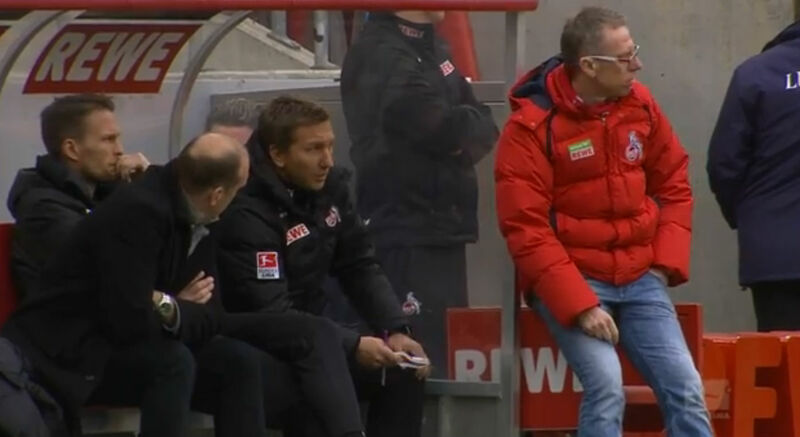 Be the first to comment on "Effzeh auf English: Re-Live Blog of 1. 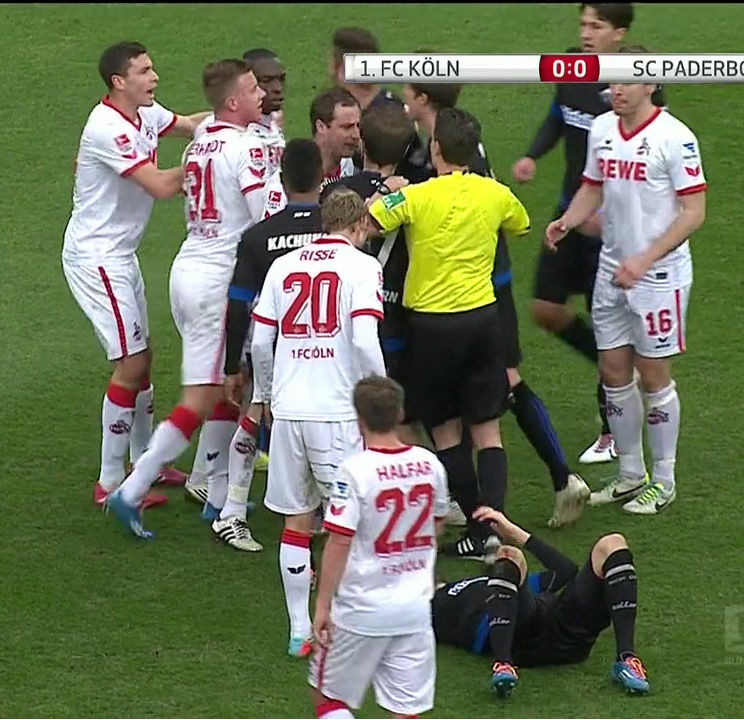 FC Köln versus SC Paderborn."